There are two zipped compartments, one to take a laptop, iPad, A4 sized magazines, and other accessories; one to take several clothes, book, sunglasses, and other personal items. Two zipped small pockets can be found on the front cover to take small items like napkins, changes, headphones and etc., a perfect fit for daily commuting and short trip. 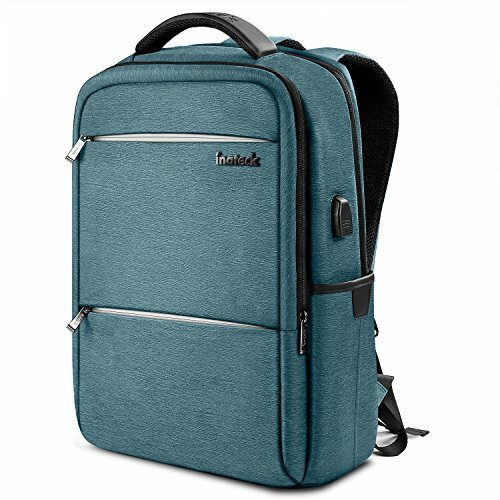 Considering various inconveniences can happen when you go on a travel, Inateck has optimized the design of the backpack. A luggage strap is set on the back to help you fix the backpack on your suitcase. A high-density rain cover is packaged to relieve your worries in getting accidental splashes on rainy days. A special reflective strap offers you extra assurance when go out at nights. 【Improved Version with SBS Zipper】This bag is designed with dual SBS zippers, which occupies the second largest share in global zipper market. More tough than your expect. 【High-Grade Materials】Made from waterproof, scratch-resistant, anti-tear special nylon fabric, and breathable, wear-resistant microfiber synthetic leather. Comes with a high-density waterproof cover. Double water-resistant when used outdoors. 【Multiple Unique Features】Keep valuable items secure with a hidden anti-theft design. A luggage belt lets you pull your suitcase with one hand for easy travel. Two side pockets hold personal belongings like a water bottle or umbrella. 【Large Carrying Capacity】It can hold 15.6 inch laptop and size below. Dimension: 45 x 30 x 13 cm / 17.7 * 11.8 * 5.1 inch.